Powers/Abilities: John Pillinger was a good investigative journalist and filmmaker. (Iron Man IV#1 (fb) - BTS) - John Pillinger spent twenty years making investigative films, developing a reputation as a seeker of the hard truths and for being ruthless in his pursuit of said truth. Though highly unrecognized by the mainstream culture, Pillinger developed a following of intellectuals, critics, and activists. Pillinger sought to create a new film called "Ghosts of the Twentieth Century", and was surprised when Tony Stark, the famous munitions dealer and inventor, agreed to an interview. (Iron Man IV#1) - Pillinger arrived at Tony Stark's Coney Island factory with his cameraman Gary. They immediately set up to interview. Pillinger immediately set about asking questions about Stark's weapons-creating history and whether Stark knew about the long-term damage those weapons had caused. Stark patiently answered each of the questions, even though Pillinger frequently interrupted him. After they discussed Stark's former injuries and his creation of Iron Man, Stark grew slightly more impatient and defended himself. The interview soon ended. With a handshake, Stark asked Pillinger if he truly believed he'd done anything to change the world. Pillinger admitted that he didn't know. Comments: Created by Warren Ellis (writer) and Adi Granov (artist). It certainly looks like John Pillinger is based on Australian documentary film-maker, John Pilger. 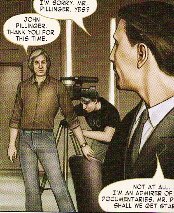 (Iron Man IV#1) - Cameraman Gary recorded John Pillinger's interview with Tony Stark.